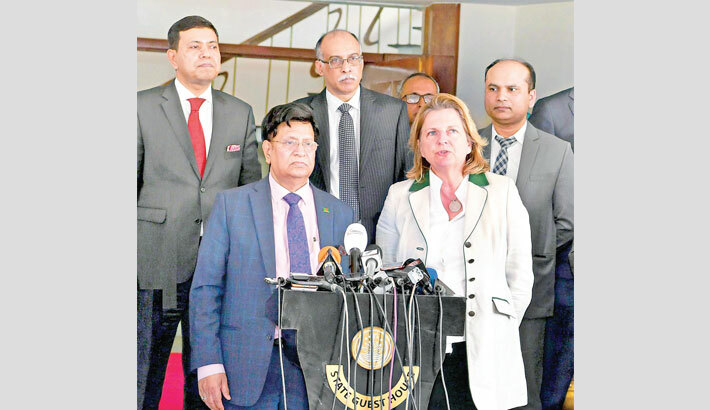 Foreign Minister Dr AK Abdul Momen on Wednesday said Bangladesh and Austria agreed to work together in the field of education, power generation, renewable energy and skill development. The minister disclosed the outcome of bilateral talks with Austrian Foreign Minister Dr Karin Kneissl at the state guesthouse of Meghna. The two foreign ministers briefed the media after holding a one-hour bilateral discussion to strengthen relations between the two countries. The Bangladesh foreign minister said Prime Minister Sheikh Hasina chalked out certain development roadmaps aiming to graduate as a developing country by 2021 and turn Bangladesh into prosperous Sonar Bangla by 2041. “For that we need lots of investment, lots technology transfer and better trade. We discussed bilateral issues and those are win-win for us,” the minister said. Bangladesh also proposed direct air connectivity between Dhaka and Vienna to explore more avenues of development cooperation and better trade with Austria, said AK Abdul Momen. The Austrian foreign minister highly appreciated the tremendous efforts of Bangladesh to provide humanitarian support to the displaced Myanmar citizens.